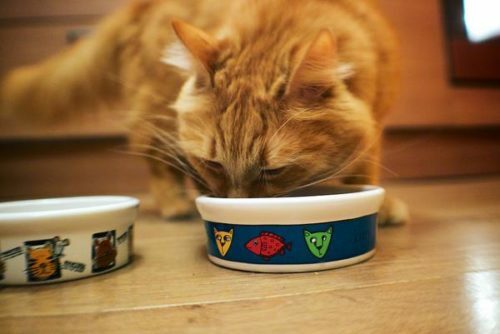 “How much should I feed my cat?” is one of the most common questions our clients ask. 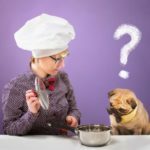 Veterinarians and cat behaviorists must often answer cat food-related questions, such as what is the best cat food, is dry food better for cats and others. The only straight answer to this question is: Provide your cat enough food to maintain healthy weight and not enough to gain excess weight. Isn’t that brilliant? But what does it mean? If you are using commercial cat food, then the easiest way to determine how much food to give your cat is to check the label on the package. 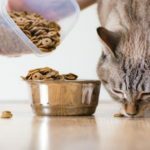 If your cat is not on a commercial diet, you will either need to do some caloric calculations or go by feel (provide a tablespoon per meal and see how your cat’s weight changes). Note: According to the National Research Council a lean cat needs 100 × Weightkg0.67 kcal per day. Therefore an average cat weighing 4 kg (8.8 lbs) needs ~253 kcal/day. However, this number depends on many things and is not written in stone. You will find a table on every cat food package (dry or wet) with an approximate amount of food necessary to a cat depending on its weight and/or age. These numbers are only examples – always check the label. 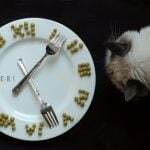 If you provide your cat different types of food, divide those amounts into meals. For example, if you serve three meals to your cat, then one meal is 20 g of dry, 50 g of wet and 35 g of raw food. From there you can change from food to food as you think appropriate. You don’t have to weigh each meal. Weigh once and either use a measuring cup or note the number of spoons or visually remember the amount. The easiest way is to measure a daily amount in the morning and then serve it in different meals until the cup is empty in the evening. 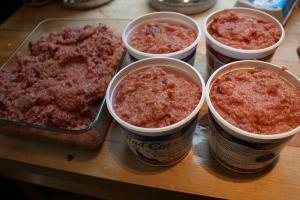 For canned cat food it’ll be easier if you round the daily amount to full cans, cups or trays. If the package states a range instead of a specific number, always start with the lowest margin and modify the amount depending on how your cat’s weight changes. 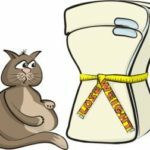 IMPORTANT: The only thing that tells you whether you feed too much or too little is if your cat puts on or loses weight. Your cat meowing at an empty bowl or stealing from the table is not necessarily a sign of hunger. See here for more help if your cat is constantly begging for food, despite being well fed.